Have had the best day with my momma ❤️ @caroncolleen Love the Crabapple Festival! Wine and bracelets! What a combo 😊 getting ready for the Crabapple Festival tomorrow! BEad creative.. BEad inspired.. BEad HAPPY. If there is one place in the world that I know will never let me down. Will never disappoint. Will never let me walk away empty-handed… It is Nordstrom. I have always held a strong belief that Nordstrom is the best place on Earth and that if I am in search of happiness or warmth, I need travel no further than the beautiful mecca of decadence that is Nordies. Unfortunately, during several stages of my life which I am sure others can relate to (poor college student, struggling recent grad and my current status: self-employed creative mind), I have seriously lacked the funds to indulge my passion. There are three words that create a solution for the financially-challenged with incurable Nordies lust: Mix, Replicate and for the love of God, FOCUS. Now for the cool part: Mixing and Focusing are things that anyone can do on their own. I have now mastered the art of replicating! For certain jewelry pieces, at least. Pictured above are two sets of bracelets. The set on the left is Simone Sebbag and was featured in the most recent Nordstrom catalogue, where a lovely, tan model showcased how easily these bracelets can work themselves into your next beach vacation wardrobe. Stunning… and also $522 for the set. I don’t know about all of you other Spring-Breakers out there, but I would feel much better about spending my hard-earned cash on some skinny margs. Luckily, now you don’t have to sacrifice style for a bargain! At just $16 a piece and $44 for a set of 3, Bead Happy bracelets are a high-quality alternative that allows you to rock the latest trend on vacay without spending a whole paycheck. The WHOLE set on the right is available for $132. Now I would say that is something to BEad happy about. 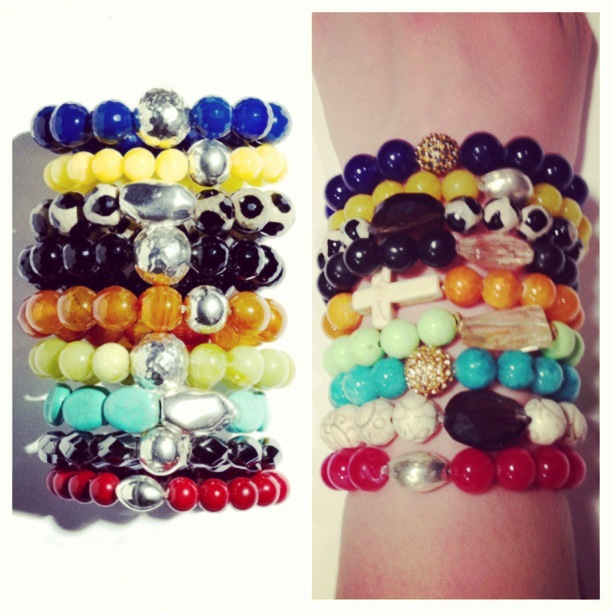 Posted on January 22, 2013 January 23, 2013 by Stephanie Colleen	This entry was tagged accessories, awesome, bargain, beach, beadhappy, beads, bracelets, fashion, jewelry, lookalike, nordstrom, pretty, vacation. Bookmark the permalink. I think being a free-spirited hippie is awesome… I plan to wear your beads with my braid in my hair haha. Once I pick some that is I am working on it!!! Congrats on leaving Corporate America. LOVE it! They would look great with a braid 🙂 Let me know when you want to order!